25% OFF ALL PET TRAVEL BARRIERS!! GET YOUR PET READY FOR VACATION TRAVELING THIS SUMMER!! LIMITED TIME OFFER!! 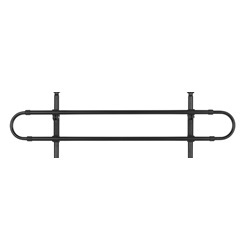 2 bar extension provides 10 inches of height for the Model 4724 barrier ONLY. Installation and removal is easy without tools. Finger Screws allow easy adjustment to slide bars and stop pets from pushing them in with the snout. Tubular, with black, epoxy powder coated metal reduces glare. NO TOOLS OR HARDWARE REQUIRED! This extension will only fit the Model 4724 barrier. Imported.